Oh dear. As Madame Butterfly herself might say, it all started out so well! 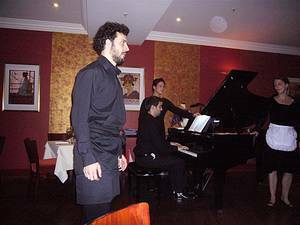 Bel Canto opened in the heart of the City a few weeks ago, a piece of bad timing that was operatic enough in itself. Many of the workers in this quarter of the capital currently do not have the wherewithal to make soup from the pocket fluff of their Hugo Boss suits, let alone choose between fish pot facon bouillabaisse or roast sea bass with fennel as a main course. Yet Bel Canto still bristles with a cynical confidence. It is the sister restaurant of two branches in Paris, which apparently operate with much success in the central area of Hotel de Ville and the suburb of Neuilly . The London branch is perhaps harder to find. We had to ring up for extra directions after trudging the rain-lashed, empty streets of the financial district with no luck. ‘Walk through Balls Brothers wine bar and turn left,’ they said. We did, and ended up in a Balls Brothers toilet. All things considered, maybe we should have stayed there. At last we find the restaurant and a receptionist who turns out to be the pianist ticks off our names. We all travel down to the basement together in a tiny lift and decant into the split-level restaurant. Here, the air is thick with the aroma of new furnishings and several coats of ripe red paint in an unhappy shade I would call Bleeding Intestine. In the centre of the room, tables are ringed around a baby grand piano. A few opera costumes on headless dummies are a low budget attempt to inject a theatrical air, but the dead atmosphere of the provincial hotel chain is the keynote that prevails. The ambience is not helped by the fact that there are only four tables in tonight. Or that the two women at one of those tables spend most of the evening on their mobiles. How can they get a signal? From the gods of polite behaviour? The dinner menu is a brisk business; £65 per head, with six or so choices in each course. There are lots of mentions of truffle, foie gras, lobster, caviar and pommes chateau; all designed to give an air of cosmopolitan luxury to reassure punters alarmed at the bold price. Starters include steamed red mullet with courgettes siffles and sun blushed tomato; artichoke hearts with pesto salad, smoked salmon and citrus dressing; lobster and pan fried foie gras salad with crispy apple and lightly spiced dressing. Main courses include slow cooked beef pot-au-feu served with fleur de sel and Dijon mustard and more fresh lobster, this time with baby vegetable lasagna and Avruga caviar toastini. It reads like the kind of faux posh rubbish you’d expect in the third class restaurant of a Russian cruise ship. Will it taste any better? No single dish works. Nothing is truly fresh or cooked properly. Everything smacks of pre-prepped catering meals hurled together in a kitchen incapable of even simple grilling or serving a hot piece of toast. The menu boldly states that an apple soufflé will take 15 minutes. It arrives in two and comprises half a scooped-out apple filled with something that tastes like a meringue made of cardboard and grit. The wine list is a car crash of greed and stupidity, aimed at the kind of customer who falls for the three card trick men in Oxford Street. It’s a dreadful shame, for the singers and performers don’t deserve it. Contrasting against this backdrop of catering cynicism, they are keen, young and fresh. All have worked hard in their fledging musical careers. Most seem to be studying at various conservatoires or colleges, while supplementing their grants with bar jobs or this. They don’t really serve the food, a proper waiter does that. ‘We are supposed to pick up the odd plate,’ a sweet-faced soprano wearing a little white apron tells me. Throughout the evening, the troupe produces popular chunks of Puccini and Verdi with uncorrupted élan. Which is more than the kitchen do. Bel Canto would work so much better if they served big bowls of spaghetti with gutsy sauces and rough red wine instead of this overwrought avec fleur de sel French fare. But there would be less of a profit in that, so they don’t. 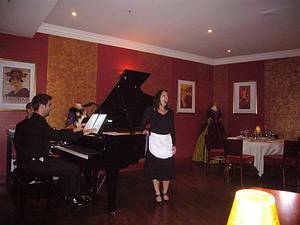 Bel Canto, Minster Court, Mark Lane, London EC3R 7AA.Tel: 020 7444 0004. Dinner for two, excluding drinks and service, £130.